The strategy of BRITE Constellation is to observe one star field with typically 15 primary target stars during at least 15 minutes per satellite orbit and for up to half a year. The point-to-point scatter (rms noise) of the collected photometric data during that 15min collection time is about or below 0.001 mag for stars brighter than 4th magnitude. 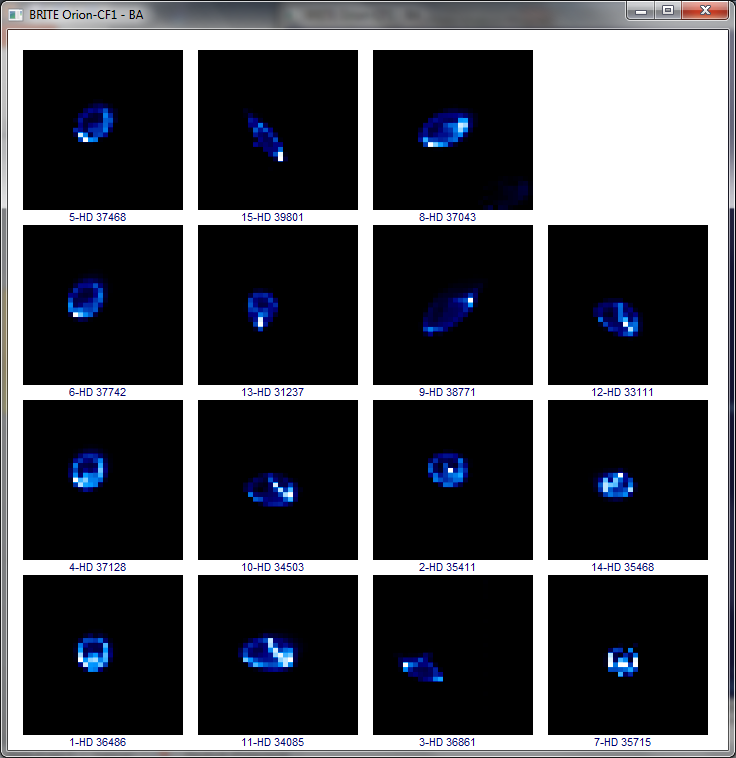 The images are defocussed, as shown in the figure below, to avoid saturated pixels and reduce jitter noise due to satellite pointing instabilities. Each satellite has either an instrument sensitive in a red (550 -700 nm) passband or in a blue (390 – 460 nm) passband. The unvignetted field of view of both the red and the blue version of the camera is about 24 degrees in diameter. 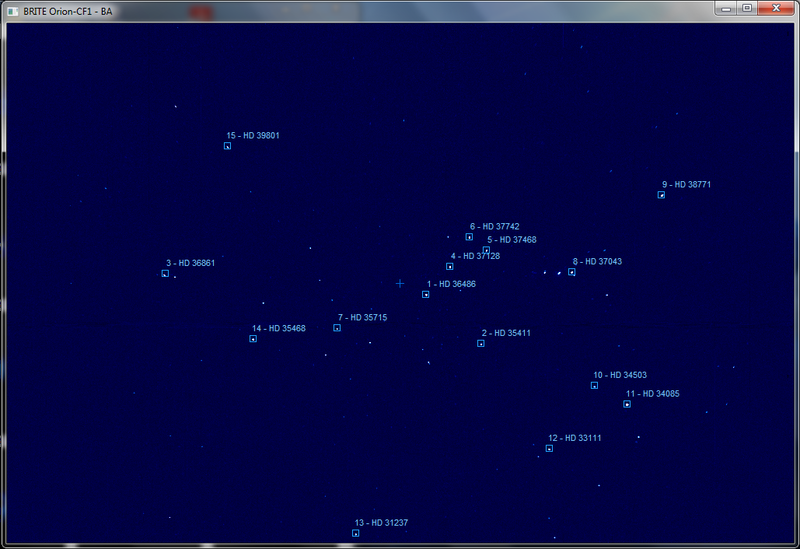 The images below are full frame exposures of the Orion field. On top is the red image obtained by UniBRITE and below of it the blue image recorded by BRITE-Austria, both December 2013. 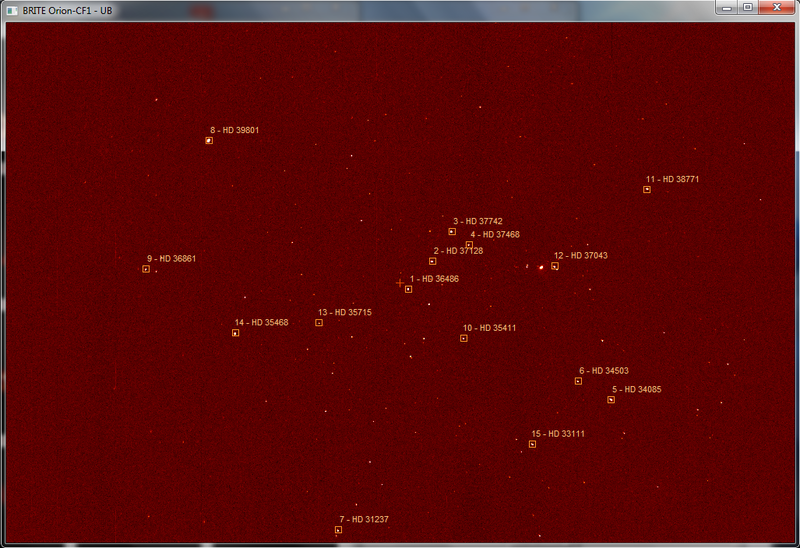 For each of the target stars in the field a subraster section (image data) of the CCD containing the Point Spread Function (PSF) and sky background will be transmitted to the ground. The PSFs of both camera types were set in a round shape with a diameter of about 8 pixels in the middle of the field. Towards the edges the PSFs progressively deviate from that shape and their form gets more complex. The figures below show the PSFs from 32 x 32-pixel raster images that are extracted from the full frame images (as illustrated in the Figure above) where the top red are from UniBRITE and the bottom blue from BRITE-Austria. The different shapes of the PSFs depending on their positions on the CCDs are clearly visible. The BRITE photometry is conducted with a KODAK 4008 x 2672 pixels CCD detector with a plate scale of 30 arcseconds per pixel. A filter mounted before the entrance aperture of the telescope and a baffle is also placed in front of the optics (see the Engineering page). 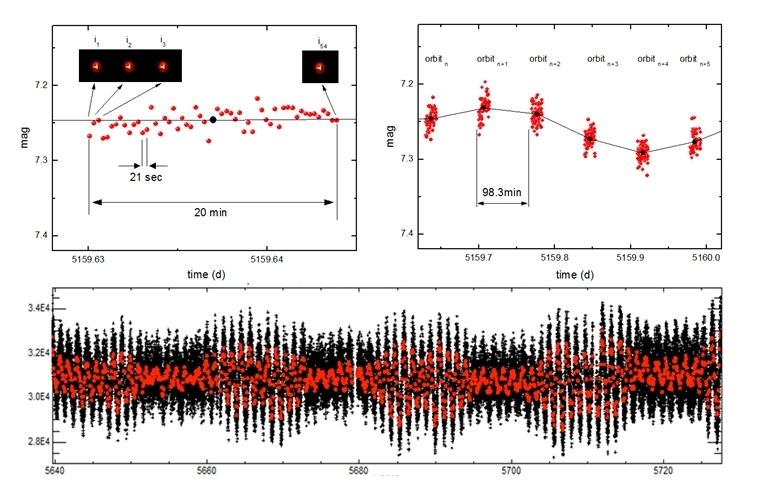 The properties of the photometric time series are constrained by the camera exposure time for bright stars and are in the range of 1 to 5 seconds, collected about 3-4 times per minute and for 15-35 minutes per orbit. The overall time base of observations of a certain field is limited to about 180 days constrained by the minimum Sun exclusion angle of 90 degrees from the aperture plane of the telescope. In addition straylight conditions from the bright Earth have to be also considered.